Last Wednesday, March 13, Fr. John, Mr. Schultz, and the Lower School Boy's Club were on 1160AM The Quest to talk about bringing Christ to others. The boys talked about their school club (which they've nicknamed "the Transformers") and the virtues they learn about. Mr. Schultz talked about the ways that HSP forms its students, particularly on the Lower School's regular Rosaries. 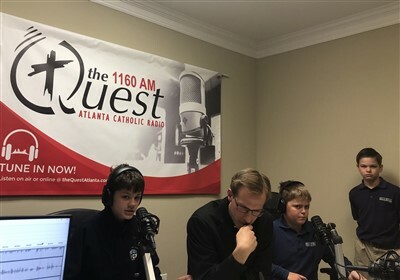 The Catholic radio station is in the middle of a spring fundraising drive: https://thequestatlanta.com.